Just imagine a world where live-action episodes of Star Wars and Star Trek are both appearing on television every week. It could totally happen: You know that George Lucas is not going to rest until he finds an affordable way to film the 50 live-action TV scripts that are already written. And it's really just a matter of time before Paramount decides it can make money with televised Trek again. If this ever does happen in our lifetimes, we want very different things from a live-action Star Wars show and a new installment of Star Trek. We want a Star Wars show to be as dark and depressing as possible, but we want a new Star Trek to be bright and optimistic. Top image: Star Trek vs. Star Wars by Apollonui on DeviantArt. We still don't know much about George Lucas' heavily green-screened live-action Star Wars show, except that reportedly it takes place in between Revenge of the Sith and the original Star Wars movie. It's a dark time, when the Empire is ascendant and the remains of the Republic and the Jedi are scattered and destroyed. Assuming this show is really going to try and show us what the galaxy is like when the Dark Side has won, and the Rebellion isn't really getting its act together yet, then it'll be a pretty bleak picture. Rumor has it we'll follow bounty hunters and smugglers, possibly even including Boba Fett himself. Instead of people trying to fight the huge battles, like in the six movies and the Clone Wars series, we could follow people who are just trying to get by, and survive for one more day. "Victory" in this context could mean not getting killed, and getting enough credits to keep the Hutts at bay. So we just got done admitting that Star Trek: Deep Space Nine is our favorite Trek. And yet, we really don't want another morally grey, depressing Star Trek show. Everybody has their own ideas about what a new Star Trek show should be like. There have been tons of pitches. For my money, a new Star Trek show ought to take place further in the future than the TNG era, and it ought to show the Federation and Starfleet facing some huge new challenges. And defeating them. For the past decade, Trek has been focused on exploring its past, from Star Trek: Enterprise to the J.J. Abrams' alternate-universe version of the Original Series. But the spirit of Star Trek is all about moving forward. Wouldn't it be way cooler to see the Federation 50 or 100 years after TNG? How would the galaxy look different after several rounds of improvement in warp drive technology? Would the vast distances across the galaxy be much easier to cross? 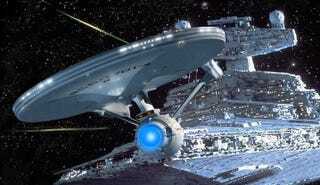 Meanwhile, how would the galaxy look now that both the Borg and the Dominion have been significantly humbled? And whether it takes place in the far future or some other point in the show's history, the next Star Trek show should be positive, humanist and empowering. Star Trek is what it is: a holdover from the Space Age, the post-Kennedy era in which we raced to the Moon. Now that we're racing, instead, to dismantle our space-going capability, a forward-looking, can-do Star Trek seems like an anachronism. But that just makes it more important. If our politicians aren't going to push us to celebrate the wonder of space exploration, then it's up to pop culture to fill the gap. Star Trek and Star Wars both feature happy endings — at least, Return of the Jedi has the most ridiculous Yub Nub-tastic upbeat ending ever created. And Star Trek's happy endings are often bittersweet, because the Enterprise crew sustained losses on a mission or because they faced a dilemma with no easy answer. But nevertheless, when I was thinking about this over the weekend, it hit me that Star Trek is basically about progress, while Star Wars is fundamentally about stuff that will never change. But more importantly, a huge theme in Star Trek is the improvement of the human race as a species — Captain Kirk was given to speechifying about how humans are reaching to become something greater, and Captain Picard actually claimed on occasion that we had gotten past some of our baser instincts. Meanwhile, in Star Wars, the Dark Side of the Force is eternal. It can't be destroyed. You can kill individual Sith, but the Dark Side will always be there, and each generation will be tempted anew. In Star Trek, there's really no such thing as capital-E Evil, per se. The Borg are pretty horrible, but they have their own point of view. And the Romulans, Klingons, Ferengi and other races are just people, with a different culture but not really an evil value system. The more you understand these other cultures, the closer you get to making peace with them, or finding a way to live with them at least. In Star Wars, meanwhile, there is capital-E Evil, and it's indestructible. It can't be reasoned with, and it's only interested in power. (Although of course, you can redeem someone who's fallen to the Dark Side, the way Luke redeems his father.) This is probably one reason why people sometimes describe Star Wars as intrinsically more of a fantasy than Star Trek. So that's why, when it comes down to it, we really want to see Star Wars do more to torment its characters with the indefatigable nature of evil. And meanwhile, we want to see Star Trek show how humans can grow and overcome challenges. Maybe one day, we'll get to have both things. Let's hope so, anyway!